Facilities that track and manage their parts and inventory effectively see a huge increase in efficiency of the maintenance department, which typically leads to significant savings and an improved ROI. With parts and inventory management software, you can expect a major decrease in the amount of work delays you experience, because the parts you need are always on hand! Plus, you’ll see less equipment downtime (especially unexpected shutdowns) and less costly, unnecessary stock overflow. With all of these benefits considered, it’s clear a good parts and inventory management system will allow you to not only improve your maintenance department’s efficiency, but also to increase your Return on Investment (ROI). 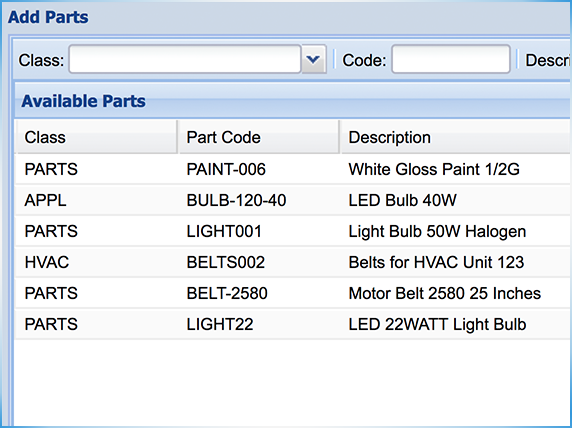 Using our Parts and Inventory Management System, you can keep information on all of your spare parts in one convenient, easily accessible location. Maintain records on your entire inventory so your maintenance team will always know exactly what stock you have and how much of it you have. 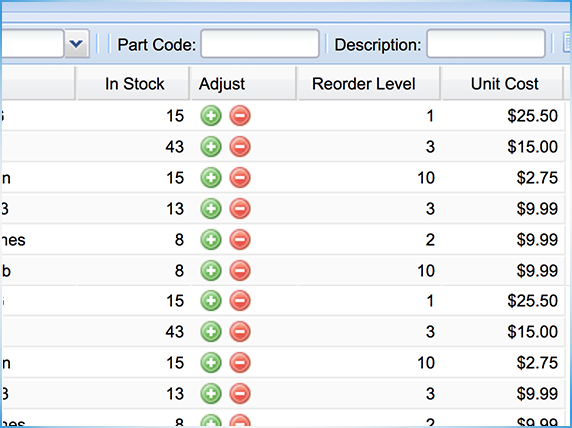 Easy tracking of all your stock items to reduce downtime. You will use this feature every day. Link any part to any assets to maintain spare inventory where you need it the most. Your maintenance department can quickly see the parts associated with each asset and how many of those parts are in stock. Always know exactly what parts are needed for a maintenance request quickly and easily. Know which parts are needed to complete a task with one glance. You will use this feature a couple of time a week. 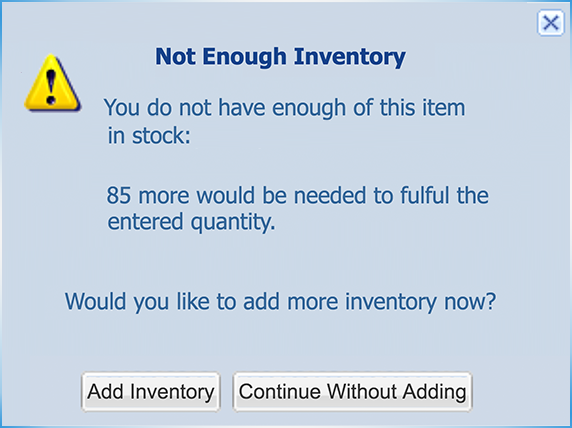 Being alerted when stock falls below a certain level will help you make sure you never run out of an inventory item when you need it most. For example, when planning preventive maintenance, knowing that you will have the parts on hand before you actually get started, will help maximize your time and maintenance department efficiency. 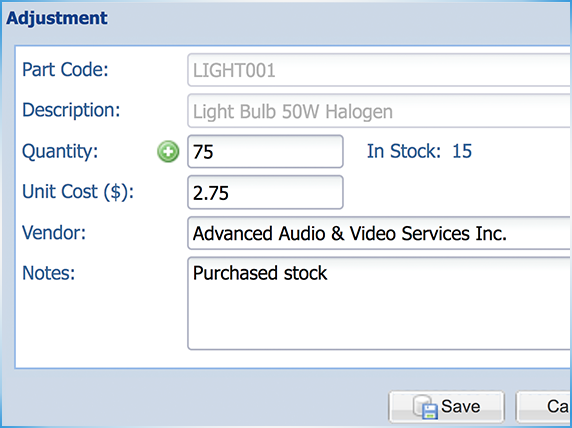 Maximize efficiency with alerts when stock is low. You will use this feature a couple of times a week. Trend your inventory usage, zero in on missing stock, and find out exactly where items are being used. 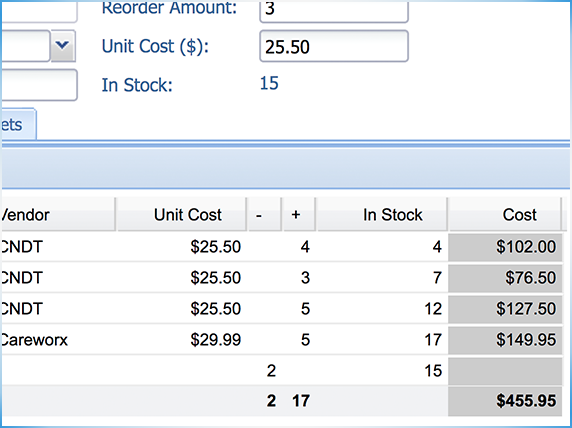 With this feature you can save money by analyzing historical trends of your inventory levels then buying in bulk when necessary, or keeping only the minimum needed of items that expire quickly. Save money by analyzing historical trends of your inventory. You will use this feature one per month. Stop wasting money on your parts and inventory. Use the price tracking feature to keep detailed records of your initial purchase price, re-order prices and even average cost for each part, so you can make better decisions about when to buy, how much to buy and most importantly, which vendor to buy it from. You will use this feature once per month.